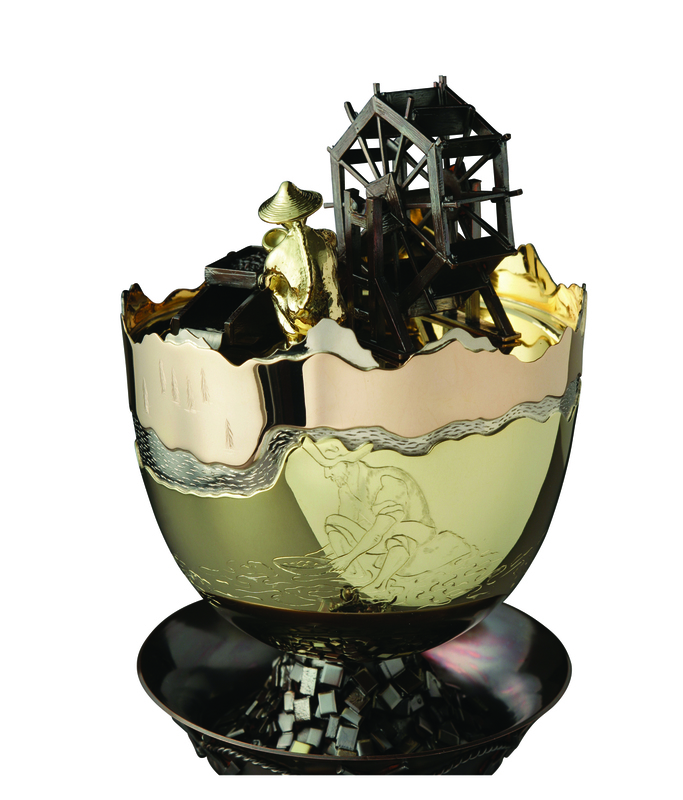 Theo Fabergé, only living grandson of Russian Imperial Jeweller Carl Fabergé, has created the GOLD RUSH EGG in celebration of the pioneers who came to California in the years following 1849, and created both the legend and the wealth of the Californian gold rush. He pays tribute too, to the brave men and women who found the precious metal he has worked in for so many years. The Californian bear stands erect and fearsome in his role as guardian of the natural treasures of the Golden State. The bear presides over the images, hand-engraved on 18-ct yellow gold, of the Clipper arriving in harbour at San Francisco bearing its cargo of Forty-Niners after the treacherous voyage round Cape Horn. To the reverse, the Conestoga wagon with its families of prospectors making their arduous journey for the promise of gold. 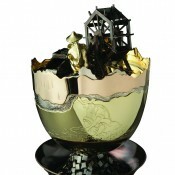 Theo Fabergé places the Sierra Nevada mountains at the centre of his GOLD RUSH EGG, snow-capped over their red-gold flanks. At their foot flows and falls the Sacremento River in white gold, and on its banks we see the miner seeking his treasure from the American River. 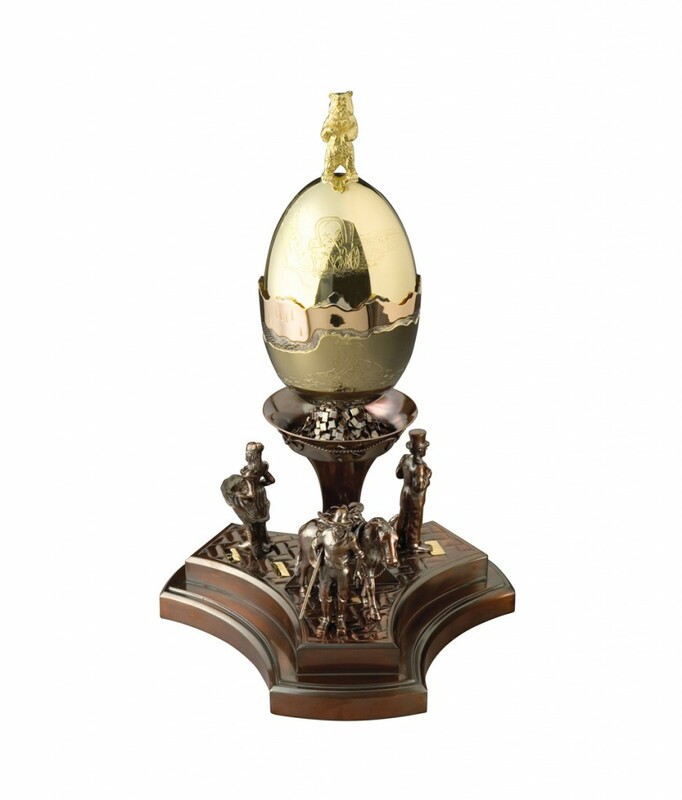 To the reverse, a pair of hand-engraved scales are poised on the solid gold egg-shell, ready for the day when his patience and labour are rewarded. A sifting-pan bears miniature pairs of pick-axe, shovel and woodman’s axes, over a pedestal around which Theo places the heroes of the Gold Rush. The prospector rests for a while next his pack-mule, laden with tools; a business man contemplates the risks and potential of his venture - and its fruits; and Theo depicts the girl in the saloon-bar, the miner’s sweet solace after weeks of lonely labour ’ Clementine’s little sister? 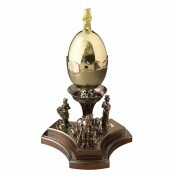 Open the Egg to view the surprise; a hand modelled water-wheel rotates as it carries the ore-bearing white-gold water to the red-gold Chinaman tending his Long Tom. And in the family tradition, Theo reserves his last discovery. A perfect miniature of the central pedestal of the GOLD RUSH EGG presents an original nugget of Californian gold: the journey, the privation, the labour, the dream - all yield their reward to the inheritors of this proud American tradition as they face the challenges and opportunities of the 21st Century. Materials: 18 carat gold and metals.